The Avengers have made cameo appearances in various comics, although, due to copyright reasons, they have never been named as such. Every appearance features the pairing of Steed and Mrs. Peel which may not be everybody's favourite combination, but is certainly the most famous due to the early export of those episodes worldwide (and most especially to the USA). The most blatant appearance by Steed and Mrs Peel must be that in issue 13 of the relaunched Superman title, published in the USA in late 1987 by DC Comics and dated January 1988. In this story, 'Toys in the Attic', written and drawn by English-born, Canadian-raised comic artist John Byrne, Superman has a meeting at the Daily Planet offices with a male and female duo, who are introduced as 'fellow...police officers'. The male character is wearing a bowler hat and suit and carries an umbrella. The female character is wearing what looks to be a leather jacket, skirt and boots. They are on the trail of W. Percival Schott, previously one of the most-respected toymakers in Britain, but who has now gone mad. The British duo explain that although it seemed obvious Schott was carrying out his murderous crimes they had not paid him as much attention as they were used to the actual culprit being someone much less blatant. (A nod to a plot device used in many Avengers episodes). DWM #173, published by Marvel UK in May 1991, 'Party Animals', written by Gary Russell and drawn by Mike Collins and Steve Pini. The Doctor (Sylvester McCoy period) and Ace attend Bonjaxx's birthday party at Maruthea, centre of the time-space vortex. The party members are all different sci-fi characters from TV and comics. A fight breaks out and the Doctor leaves. Captain Britain has lifted Steed and is preparing to deal him the knock-out blow, but he's reckoned without Mrs. Peel who is tapping him on the back. The Prisoner Book C, 'Confrontation', published by DC Comics in 1988 and written by Mark Astwith and Dean Motter and drawn by Dean Motter. Main character Thomas attends the funeral of a fellow Ministry agent with his daughter. His wife is in The Village. Look to the graveside for a familiar-looking pair of mourners. Wonder Woman went "all Emma Peel" between issues Wonder Woman #179 (October 1968) and Wonder Woman #204 (February 1973). She lost her Amazonian powers and was swiftly taught karate, judo and kung-fu by a bowler-hatted Oriental gentleman called I-Ching. In an interview in The Complete Wonder Woman, writer Denny O'Neill claims to have never seen the show before moving the career of Diana Prince in this direction. Artist (and later writer), Mike Sekowsky, does acknowledge the influence, however. The dynamic duo of Steed and Peel make an appearance in a bar scene in this work from 1994. 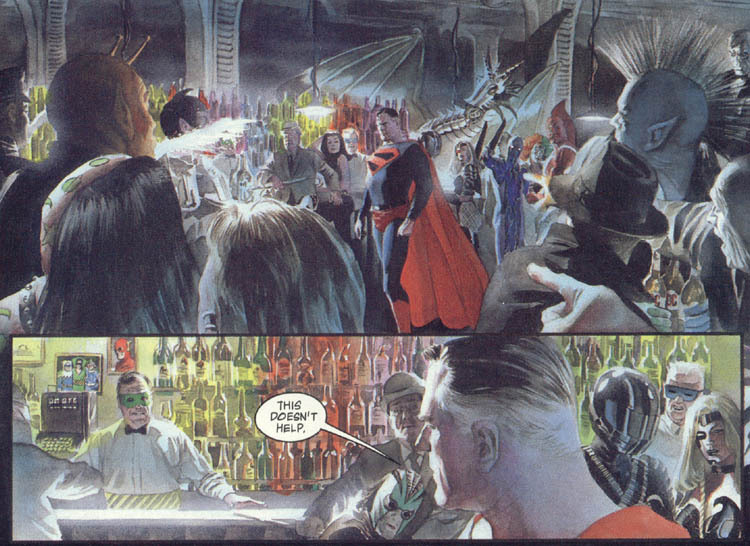 The artist, Alex Ross, is well-known for his use of photo-referencing famous people into his strips. The Avengers are standing just behind the Man of Steel. Big Ben was a UK-sourced superhero who featured in the magazine Warrior in the late 80s. He has no direct tie-in with The Avengers, but he did wear a bowler hat, carry a rolled umbrella and sported a rather fetching carnation in his lapel, which is close enough for me. Once I've had the chance I'll go in to the loft and dig out the issues and scan a picture of him in. There were a couple of in-jokes in The Avengers comic book series from Marvel Comics. In issue 83, The Avengers (the super-hero group) meet Roy Thomas and his then-wife Jean, who says, "Oh, wow! Which one of you is Mrs. Peel?" In issue 135, Phineas T. Horton, creator of the original Human Torch, is shown watching TV, and the bit of dialogue we hear is: "Mrs. Peel? We're needed!" If you know of any other tributes, homages or rip-offs featuring The Avengers, please get in touch with the details.